About : An offshoot of City As Material, Sketches In The City is an occasional series of observational expeditions in various locations across the capital. Mandy, Radhika and I sketch, take photographs and write poems and prose to form a collaborative eBook with underlying themes. Focusing mainly on people and interactions in public places – places that shape, and are in turn shaped, by the people in them – we’ve produced two books so far, and are working on a third. 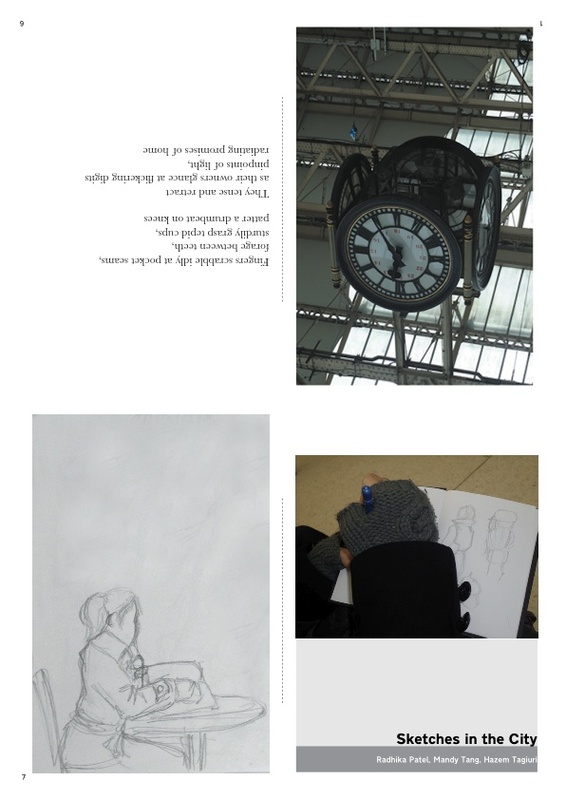 Sketches In The City was our first attempt, created as a result of visiting the busy Victoria and Waterloo train stations – places which reveal an interesting insight of the human character when bored or stressed. Highlighting the material we collected on the day, this tidy scrapbook was an playful experiment with little interpretation or narrative, letting us take the time to view hectic environments from a different perspective than usual and refine our creative processes. Sketches In The City: British Museum showcase the unique architecture and exhibits in the British Museum, looking at how visitors observe and interact with them and one another, as well as their grasp on the intangible knowledge that exists amongst that which we can see and touch. Radhika Patel is a marketing assistant at Proboscis. Having completed her Future Jobs Fund placement with Proboscis (Nov 2010-April 2011) she is working on developing new marketing strategies. Mandy Tang is a creative assistant at Proboscis. Having completed her Future Jobs Fund placement with Proboscis (July 2010-Jan 2011) Mandy’s work is focused on visual notation and illustration of projects, ideas and activities, as well as developing a special StoryCube game, Outside the Box, for encouraging outdoor play. Hazem Tagiuri is a creative assistant at Proboscis.Having completed his Future Jobs Fund placement with Proboscis (July 2010-Jan 2011) Haz’s work involves blogging on bookleteer.com about zine culture; assisting with planning and running the City As Material project and working on a research project with the University of Cambridge.